Bitcoin and its buddies just can’t seem to catch a break! Bearish moves are back in play, but bulls might still be waiting to defend these support zones. Bitcoin broke down from its earlier short-term consolidation and has sunk to the bottom of the ascending channel previously highlighted. This happens to be around the bottom half of a newly-formed larger channel on the 4-hour chart, too! 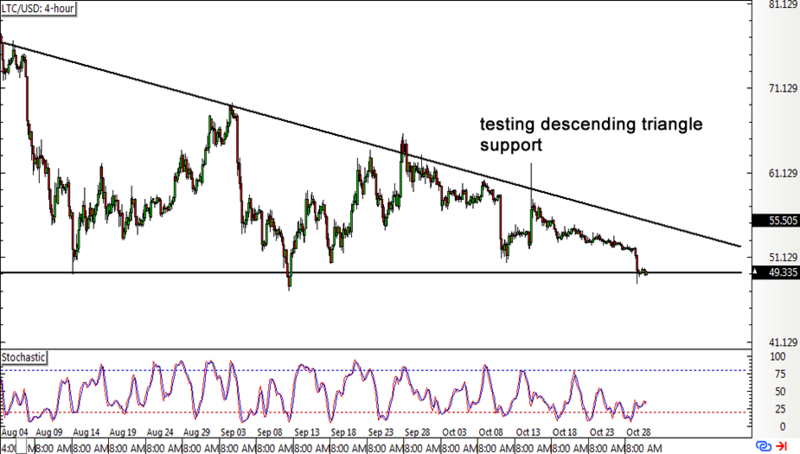 Support around 6,300 might have a chance at keeping losses in check since stochastic is hovering around the oversold region to indicate that sellers are tired. Turning higher could encourage bulls to return and spur a bounce back to the channel top at 7,500 or at least until the mid-channel area of interest. 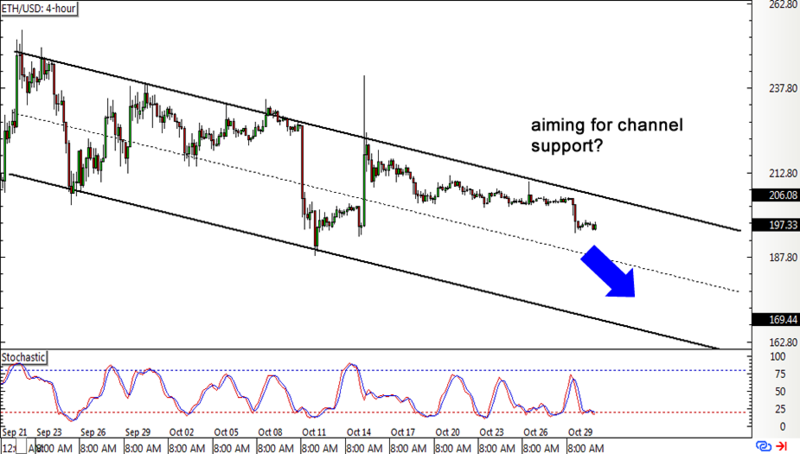 Ethereum is also moving inside a channel but a descending one this time. Price tumbled below its short-term consolidation and might be setting its sights on the cannel support around the 165.00 mark. Ether has yet to test the mid-channel area of interest, which might have some bulls waiting as stochastic is closing in on the oversold region. 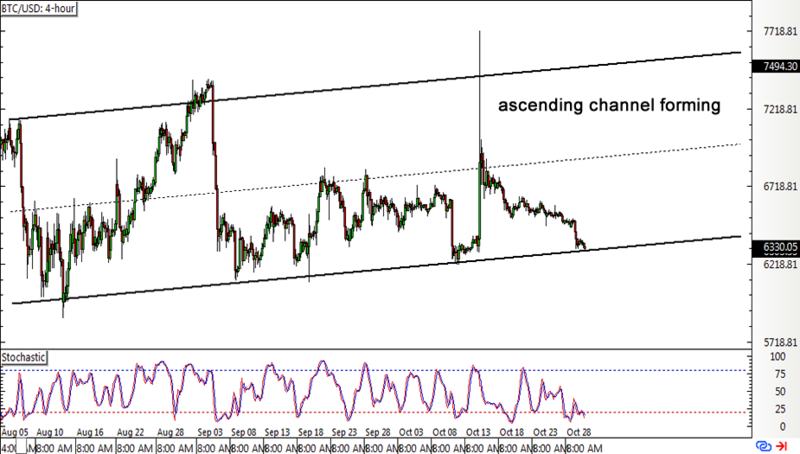 If this level, which is also near the latest lows, holds as a floor, another bounce to the channel top might be due. After getting rejected on its triangle resistance test last week, litecoin is now down to support and might be attempting another bounce. Stochastic is starting to pull up, which suggests that buyers might be ready to take the upper hand and take price to the triangle resistance again. On the other hand, a candle closing below current support levels could trigger a slide that’s roughly the same height as the triangle, which spans 49.30 to around 69.00. 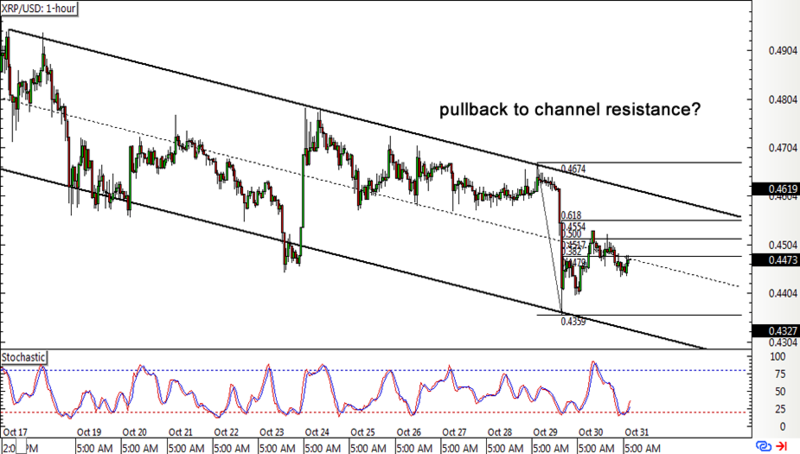 Ripple continues to edge lower inside its descending channel but is currently bouncing off support. A pullback to the channel top around the .4600 mark might be taking place, although the 50% Fib at the middle of the channel already seems to have held. Stochastic is just starting to turn higher after dipping into the oversold region, though, so buyers are just getting warmed up. A break past the Fibs and channel top could mean that a reversal and continuation of the longer-term rally is in the cards.